ZTechnik® Mirror Extenders allow you to see more easily past your shoulders, your passenger and your gear. They also move the mirror stalks further out when using a wider than stock windscreen like a ZTechnik VStream®. This is a great 5-minute do-it-yourself upgrade that you'll appreciate! 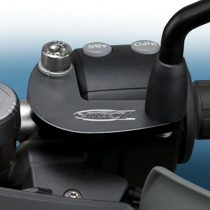 * R1200GS models with the optional BMW Spot Light Kit will require the use of Z5303 Mirror Extenders instead of Z5300. ** May limit access to the cruise control button and cover. You may choose to angle extenders forward to allow for more clearance. Exercise caution in use. Certain VStream® Windscreens, because of their increased width, may require ZTechnik Mirror Extenders where they might not otherwise be necessary. Give yourself a better view of the road and the vehicles behind you! 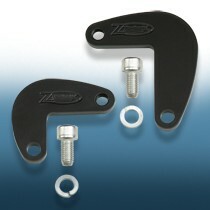 ZTechnik® Mirror Extenders move your bike's mirrors out an additional 2.0-2.5 inches (52-64mm) on each side. Competitive extenders only add 1.5 inches (less than 35mm) on each side. Each set of ZTechnik Mirror Extenders is made for specific models. 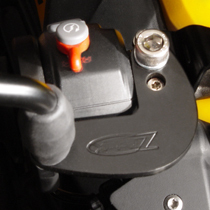 For example, the Z5301 Mirror Extenders (shown here) for the F800GS and F650GS include drilled access points for the OEM handlebar control adjusting screws.